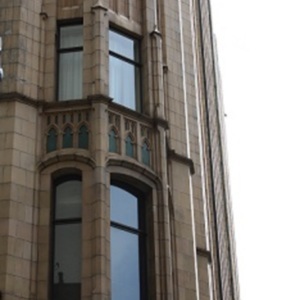 These two photographs are of the corner tower of the neo-Gothic Grace Building on York Street in central Sydney. The building was built for the Grace Brothers department store in 1930 and was designed by Morrow and Gordon. 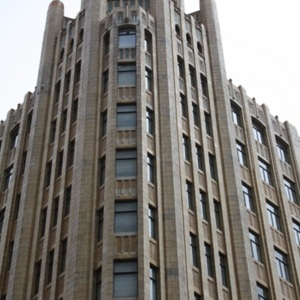 The corner tower in particular was inspired by the Tribune Building in Chicago. Medievalist features include blind arcading, whilst the top of the corner tower gives the impression of the flying buttresses common on Gothic churches. The building became a hotel, The Grace Sydney, in 1997. “Grace Building, Sydney,” Medievalism in Australian Cultural Memory, accessed April 23, 2019, http://ausmed.arts.uwa.edu.au/items/show/868.